Every year, at least 250,000 people are hospitalized for hip fractures, yet many don’t realize the injury is associated with osteoporosis risk. New research suggests that seven out of 10 older adults who experience hip fractures are not told they could have osteoporosis. Osteoporosis is a condition in which the bones become brittle and fragile from loss of tissue. This can be due to hormonal changes, or deficiency in calcium or vitamin D.
Many geriatric experts say that hip fractures are almost always a sign of weak bones. Officials at Northwell Health in New York State agree. In fact, they conducted a survey of hip fracture patients and discovered a shocking number of people that were not told about the possibility of osteoporosis. Their findings stated that 57 percent of people with hip fracture reported their hospital physicians did not suggest any osteoporosis medication after their fracture. Additionally, 25 percent said they would refuse taking osteoporosis medication. It is believed that about 10 million people in the United States currently suffer from osteoporosis. 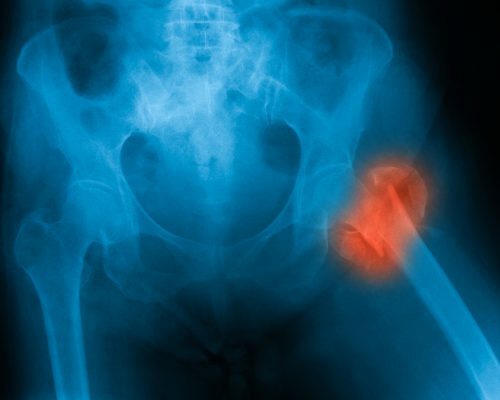 The treatment rate for osteoporosis after hip fracture is thought to be anywhere from just two percent to 25 percent. Osteoporosis in older adults is not uncommon. As we age, we experience changes in our body that can impact our bone structure. While we can’t stop the aging process, we can take steps to prevent hip fractures. One out of three adults over the age of 65 falls every year. Taking safety precautions can lower your risk of such mishaps. Here are some simple tips to help prevent falling and fracturing bones. Maintain a healthy diet with calcium and vitamin D.
Check medication side effects with your doctor since some may cause fatigue or confusion, which can lead to falls. Exercise regularly to build strength. Wear good shoes with nonskid soles. Replace slippers that have stretched out of shape and have become loose. Assess your home for hazards, removing throw rugs, electrical cords along the floor, etc. Put hand railings on your stairs and in your bathroom. There are some people who simply do not feel steady on their feet. If this sounds familiar, then talk to your doctor or an occupational therapist about walking aids. You may find that a cane or walker gives you more stability and less fear when walking around. Treatment of osteoporosis can include medications. The main function of drug therapies is to reduce the risk of fractures. Other treatments could include hormone therapy or pain relief following a fracture. For the most part though, focusing on lifestyle changes, such as improving diet and maintaining regular physical activity that includes strength and balance exercises is the best approach. Osteoporosis and hip fractures can be life-changing for older adults. It can reduce quality of life, lower confidence, decrease mobility, and impact independence. Understanding the implications of a hip fracture and the connection to osteoporosis, as well as taking immediate action to prevent further injury, can give a person a much better chance at maintaining a productive life. It is also important to note that making healthy choices in early adulthood can help build a higher peak bone mass, thus reducing your risk of osteoporosis and bone fractures later in life.